The Neckarsteig is a new trail, opened in April 2012. 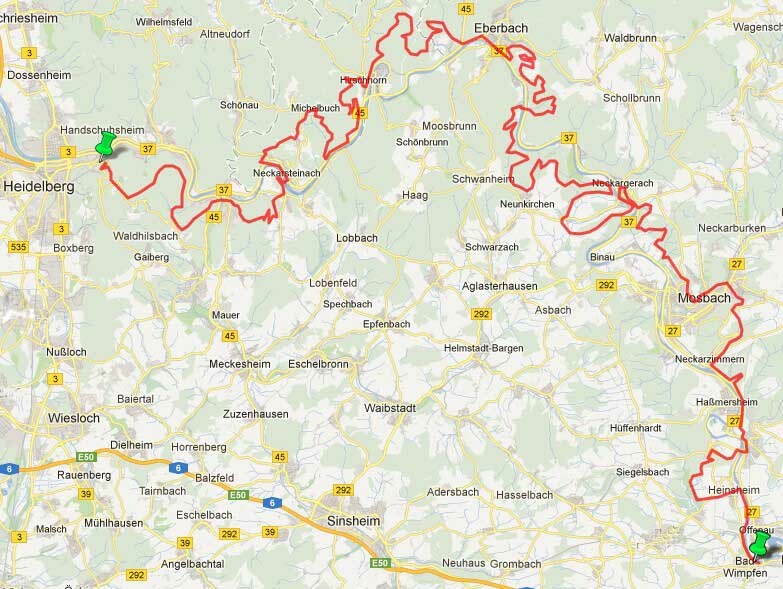 It generally follows the River Neckar from Heidelberg to Bad Wimpfen and comprises 8 stages, totalling 126Km in length with over 3000 metres elevation change. Mark Twain described a raft journey down the Neckar from Heilbronn to Heidelberg in his 1879 book "A Tramp Abroad". In the book, Twain observed "Germany, in the summer, is the perfection of the beautiful, but nobody has understood, and realized, and enjoyed the utmost possibilities of this soft and peaceful beauty unless he has voyaged down the Neckar on a raft." Unfortunately, there are too many large barges plying their trade along the Neckar nowadays to make rafting a safe proposition. However, as much of the trail is through the Naturpark Neckartal-Odenwald, this possibly affords even greater variety of scenery than Twain experienced, so one could hope to enjoy similar feelings to Twain's by walking the trail. I am well acquainted with the scenic Neckar valley from when we lived in Germany in the nineteen-seventies and appreciated the potential of this new trail. Having already walked along the Rhein (Rheinsteig) and the Elbe (Malerweg), a trail along the Neckar appeared to be an interesting addition. As well as the attractive river scenery and two ravines, the trail also includes some picturesque medieval towns along the Neckartal with their signature Fachwerkhäuser, defensive walls and castles. The daily stages are not too long, so ample time is available to explore the old towns and castles along the Neckar. Probably due to the Neckarsteig being quite a new trail, I was unable to find any hiking guides or maps from Hikeline, Kompass or Publicpress. A Rother Wanderführer is due to be published in August 2013, 3 months after my walk of the trail. However, I was able to purchase a guide and maps from the Odenwald Tourism website. I also ordered a free map of the Neckarsteig and accommodation guides for the area from the same website. Fortunately, by design, most of the stages begin and end at a railway station on the Rhein-Neckar S-Bahn route. Only 3 towns are not directly on this S-Bahn route, but they are easily accessed via other trains or bus. This really simplifies the accommodation planning as it is possible to use a single base instead of nine separate hotels for the eight stages. A central base gives the added advantage of allowing one to bring more luggage without having to use the more expensive "Wandern ohne Gepäck" packages. I had hoped to stay in Eberbach, but was unable to find any accommodation for the required 9 nights. Instead, I booked a hotel in Mosbach, which, although not being the most central town of the trail, seemed to possess more facilities than most other towns. Frankfurt's Rhein-Main airport is the obvious choice for entry into Germany because the start and end points of the Neckarsteig are quickly and easily accessed by train from the airport's underground rail station. The nearest and most convenient UK airport for me is London City Airport, which has daily flights to Frankfurt by both Lufthansa and British Airways. I used up some more of my frequent flyer Avios points to book a return trip with British Airways. After the accommodation and flights were booked, this left me with the final task of ordering train tickets for the journeys between Frankfurt Airport and Mosbach. I set a calendar reminder to order the tickets 90 days before the journeys to get the early discounted fare prices. Finally, a decision was required as to which direction to walk the Neckarsteig. From previous walks, my preference is for the last stage of a trail to finish strongly. After studying the maps, it seemed more logical to follow the river downstream and Heidelberg would be a more impressive place than Bad Wimpfen to end the trail. I notice Tobias Kretz also recommended walking the trail in this direction for these and other reasons.